Chi Spacca is over one year old now but I finally made it….barely! I knew it was near Mozza but managed to pass it three times before I gave up on Waze all together. 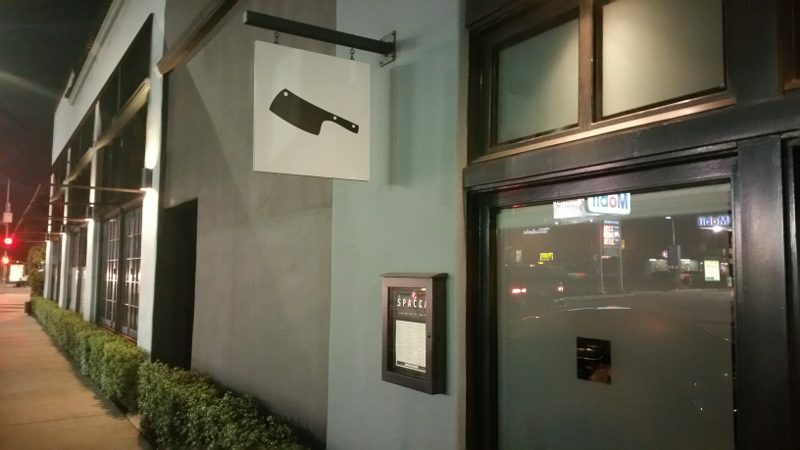 I found a spot on the street and walked past the Osteria Mozza entrance to where there is a small sign with just the image of the cleaver on it (Chi Spacca means “cleaver” in Italian). Without a noticeable sign, especially one without words, it was a bit difficult to find. Editor’s Note: Shortly after this piece was published, we are sad to report that Josh Ozersky, founder of Meatopia, passed away suddenly. Our thoughts go out to his loved ones during this difficult time. As a meat eater, when you see a description for an event that says, “If you are vegan, stop reading this now – this is not for you,” your eyes will light up. What is better than an event that celebrates all things meat? Nothing. Welcome to Meatopia. Meatopia is the brainchild of award-winning writer and Esquire’s Editor-at-Large Josh Ozersky. An annual event that was created ten years ago in New York, Ozersky brought Meatopia to Pebble Beach Food and Wine festival this year for an informal evening on the beach. The rules of Meatopia are simple. Representing every kind of animal, the meat used is meat that we can all feel good about – certified cruelty-free, hormone-free, and antibiotic-free meat. These are animals that have lived well and died respectfully. And, as an all-natural event, the chefs can use wood logs, chunks or lump hardwood charcoal as their only cooking fuels (no gas, electricity or propane is allowed). The chefs are also encouraged to celebrate the entire animal. Ozersky handpicked eight chefs from around the country to participate at the Meatopia in Pebble Beach. It was an opportunity to showcase talented chefs who are at their creative heights. Each chef was behind the grill, working on a unique dish that they created using lamb, beef, goat, pig, fish or prawns. Meatopia is an event that brings chefs to consumers and makes them and their food accessible to all. Below is a list of the participating Meatopia chefs and their meat-centric dishes. Jonathan Roberts (PigWizard, Monterey) – Pulled Pork and Coleslaw with Porkcorn. While there was not a dish to be missed at the event, there were a few standouts. Zakary Pelaccio’s tender, perfectly grilled, almost sweet Grilled Monterey Bay Spot Prawn might very well have been the favorite of the night. But the two most unique dishes of the night were Matt Accarrino’s cracklin, made from the skin of the sturgeon and then topped with sturgeon caviar eggs, and Jonathan Robert’s porkcorn. Jonathan took the pork cracklin and added a caramel bacon demi-glaze and Firestone ale to make one of the most addicting highlights of the night. Who knew you could even make porkcorn? If you like meat, then Fogo de Chao might just be paradise. 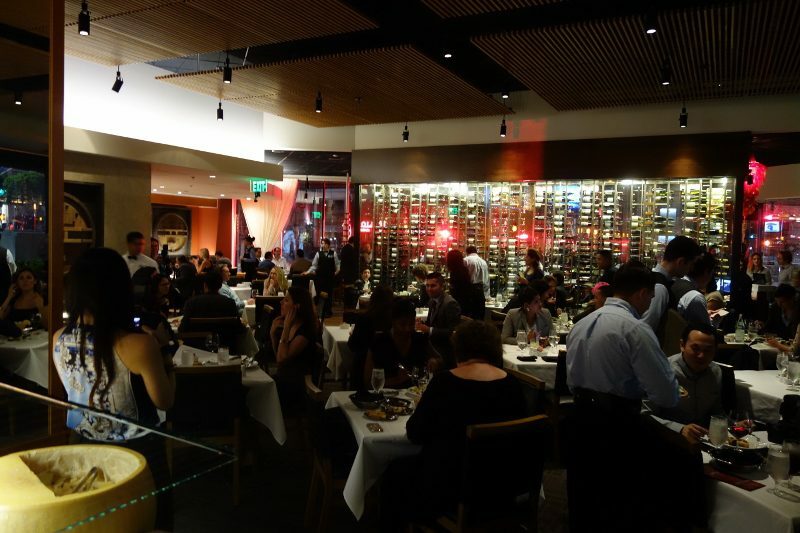 Originally from Brazil, there are now 27 restaurants in the United States with the newest location open in downtown Los Angeles. Located at 8th at Figueroa, the it took over the space that was formerly Roy’s. It is a vast open space but after a meal here, you might feel like you need all that room to roll yourself out the door.